Just use the contact form and we will help you within 1-3 business days. CAN I RETURN AN ONLINE PURCHASE TO A 7 FOR ALL MANKIND STORE? We’re sorry, but we do not accept returns of online orders at 7 For All Mankind stores. Please follow the instructions in the Return Policy section. CAN I EXCHANGE THE ITEM I PURCHASED? Unfortunately, we are currently unable to offer you exchange items. If you wish to receive another product or a different size of the same product, we encourage you to return the purchased merchandise for a refund and plitace a new order for the product you want instead. WHAT SHOULD I DO IF THE MERCHANDISE I RECEIVED IS NOT WHAT I ORDERED? Don’t worry; you can print out a new form using the following link: http://returns.bleckmann.com/?Customer=7FAM&Mode=1. Fill out the required fields, print the label and affix it to the package. If you encounter problems, please contact our customer care department and we will be happy to send you a new form. Please note that if you prefer to ship your return with a different carrier, the shipping charges will be at your expense. In addition, if you use a different carrier, 7 For All Mankind will not be responsible for any delivery delays or lost packages. It will take us up to 10 business days to process your return from the date we receive notification, in other words, from the moment the merchandise arrives in our warehouse. That is the time we actually become aware of your intention to return the merchandise. Also, please allow up to 6 business days from the time you ship the package back with Royal Mail to the time we receive it in our warehouse. The refund will be made using the same payment method you used for the purchase of the item. The time it takes for the credit to show up on your account depends on your credit institution. I DIDN’T RECEIVE A REFUND FOR SHIPPING CHARGES. WHAT SHOULD I DO? When you return an order, we only refund the price paid for the items and not the amount you spent for our EXPRESS shipping service, unless the whole order was returned because the items received were defective, the wrong size or the wrong product. HOW LONG DOES IT TAKE TO RECEIVE MY MONEY AFTER MY RETURN? The refund will be made within 10 business days from the time we receive the merchandise in our warehouse in Oldenzaal, Holland. In addition, please consider that it can take up to 6 business days for your package to arrive to our warehouse from the time Royal Mail ships. The amount of the returned items will be credited on the corresponding account of the card used at the time of order. Please remember that if you chose our EXPRESS delivery service, the shipping charges will not be refunded. The time for the refund to be credited into your account may vary depending on your financial institution. CAN I MAKE CHANGES OR CANCELLATIONS TO MY ORDER ONCE CONFIRMED? You can make changes or cancellations to your cart until you confirm payment. Once the payment is made, you won’t be allowed to make changes or cancellations. WHAT HAPPENS IF I CHANGE MY MIND OR IF I ORDERED A WRONG SIZE OR PRODUCT? We want you to always be satisfied with your 7 For All Mankind products. However, we understand that you may wish to return one or all the purchased items because the shipment was wrong or incomplete, the merchandise was damaged or defective, or you simply changed your mind. Follow the instructions you find in the page “Returns” and remember to return the item intact and in perfect condition (unless it’s a defective item) in its original packaging. WHAT SHOULD I DO IF THE MERCHANDISE ARRIVES DAMAGED OR DEFECTIVE? If your order arrives damaged or defective, please contact us right away. Our products are warranted for 1 year if found defective. In this case, we encourage you to follow the procedure specified under our Returns Policy, which applies only to merchandise purchased through http://www.7forallmankind.co.uk/en_en/. If, instead, you purchased your item at a store, please refer to the store where the purchase was made, since we do not provide assistance regarding in-store purchases. Many of our jeans undergo a distressing treatment and may show abrasions, tears or wrinkles which give them the distinctive look that sets our products apart. For this reason, products in the exact same style and with the exact same code may appear slightly different. If you’re not sure the product you purchased is actually damaged or defective, we encourage you to compare it to the photographs you find in our online site. If you have any doubts, contact our Customer Care department . WHAT DO I DO IF THE MERCHANDISE I RECEIVED IS NOT WHAT I ORDERED? If the items you received do not correspond to what you ordered (e.g., different colour or style), you have 30 days to return the purchased merchandise. Just follow the instructions in our Returns Policy section *During the Christmas period, our return policy will be extended: all orders placed after December 1, 2017 can be returned up until January 31, 2018. WHEN IS THE ORDER PAYMENT APPLIED TO MY ACCOUNT? The payment is applied the moment you enter your payment details and click on “continue”. At this point, your order can be considered complete. We accept Visa Online, Visa Debit, Maestro, Mastercard Online, Mastercard Debit, Discover, Diners Club, American Express, and Paypal. CAN YOU GIVE ME GREATER DETAILS REGARDING PAYPAL PAYMENTS? If you pay with PayPal, you will be asked to login to your account with your email address and password to confirm the payment. Using your promo code is really easy! First, make sure you enter the promo code exactly as it was given to you. Write or copy and paste the promo code when you check out, in the section PROMOTION CODE. You won’t be able to add it at a later time. Also, remember that you can only use one promo code per order. We use one of the most secure online systems currently available in the market and are committed to continually improving our software to ensure we provide the greatest possible safety and the best online shopping experience. We are a long-time member of COMODO, a worldwide cybersecurity company promoting the best industry standards and ensuring verified and secure online transactions. Your order is shipped from our warehouse in Oldenzaal, Holland. Any merchandise returns must be shipped back to Bleckmann 7575 AX Oldenzaal, Netherlands. As soon as the merchandise is shipped, we will send you a confirmation email containing a link with the tracking number to view your order status. You can click on the tracking number or enter it directly on the carrier’s website. We recommend you keep the email with the order and shipping details until you receive the merchandise. If you lose or don’t receive the confirmation email and you wish to track your order status, contact our Customer Care department . CAN I RECEIVE MY ORDER IN ANY PART OF THE WORLD? Orders placed on the site http://www.7forallmankind.co.uk/en_en/ can be delivered only to England. Standard shipping to England is FREE OF CHARGE and takes from 2 to 3 business days from the time the merchandise leaves our warehouse. Express shipping is also available for England at a charge of £12 with delivery within 1 business day. Please allow additional time for deliveries to southern areas and the islands. If your order is confirmed by 10am, it will be dispatched from our warehouse on the same day. Instead, all orders placed after 10am will be dispatched the next day, so please add a day to the delivery window. Orders placed after 10am on a Friday will not be shipped until the following Monday: please allow the aforesaid delivery time. Standard shipping is FREE OF CHARGE on all orders. EXPRESS shipping incurs a charge of £12.00 and is available countrywide except the South and Main Islands. Yes. We realize that a lot of customers work during the day and prefer having their orders shipped to their workplace. Or maybe their order is a gift. You can have your order shipped to an address other than your own as long as it is within the areas serviced as specified above. Remember that once the order is confirmed you won’t be able to change the shipping address. You will receive a confirmation email immediately after you complete your order. If you don’t receive the email, you may have typed in your email address incorrectly during the order. You can contact our Customer Care department on the page “Contact us” for assistance. HOW SHOULD I WASH MY 7 FOR ALL MANKIND JEANS? Refer to the inside care label for washing instructions and the best products to use for your 7 For All Mankind. I BOUGHT YOUR PRODUCT ON EBAY. IS IT AUTHENTIC? We have received a lot of complaints from customers about counterfeit products purchased through eBay (or other auction sites/websites). To avoid buying a counterfeit product, we recommend making your purchases through our website or authorized retailers. We would never want you to have a product that doesn’t fit you perfectly. That’s why we use a system that will help you find the right size for you: TRUE FIT. True Fit collaborates with hundreds of brands to help consumers make the best choice during their shopping experience. We have chosen to work with them because your satisfaction is important to us. Simply answer a few questions to find your True Fit. It just takes 60 seconds! 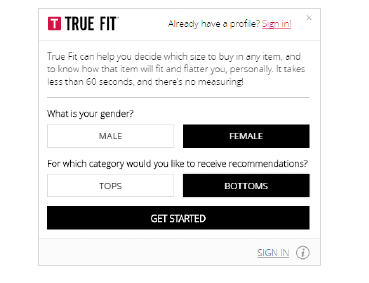 This is how it works: click on “Find my True Fit” in the product detail sheet and the following pop-up window will appear. Select your gender and the category you prefer and GET STARTED! Enter the information requested and click on NEXT. When you finish you can start your shopping and will find your perfect size written next to each product. HOW CAN I GET IN TOUCH WITH 7 FOR ALL MANKIND’S ONLINE CUSTOMER CARE? Just click on the link http://www.7forallmankind.co.uk/en_en/customer-care/contacts/, found on the bottom of each page, and then fill out the form with your details and your question to us. We’ll do our best to reply in the shortest possible time. I HAVE A PROBLEM WITH A PRODUCT I PURCHASED IN A STORE. WHAT SHOULD I DO? If you encounter a problem with a product purchased at one of our stores or authorized retailers, take the product back to the store where you made the purchase and you’ll receive immediate assistance. Unfortunately, our customer care department can provide assistance only for products purchased though our European websites. Don't worry; we have the solution for you. Click on "I forgot my password" in the page “My account” under the “Login” button. This will open a new window prompting you to enter the email you used when you registered. After you enter the email address, you will receive a new, temporary password that you can change in the section “My account” once you login. I WANT TO UNSUBSCRIBE FROM THE NEWSLETTER. WHAT SHOULD I DO? We’re sorry to see you go! If you don’t wish to receive 7 For All Mankind newsletter, you can cancel your registration by clicking on the link found at the bottom of any one of our newsletters. WHAT’S THE STORY BEHIND 7 FOR ALL MANKIND? The “premium denim” segment was born out of the launch of 7 For All Mankind in the Spring of 2000. The brand from Los Angeles, California changed the face of the denim world for good when it exploded into the scene and garnered critical acclaim for its innovative styles and its use of materials and finishes. 7 For All Mankind revolutionized the perception consumers had about denim and how to wear it. The brand combined tradition and craftsmanship with a radical way of using the fabrics and changed the concept of denim forever. At the cutting edge of design and innovation, 7 For All Mankind became a leading brand and a contemporary classic in the fashion world in little more than a decade thanks to its sophisticated designs and unmistakeable character. 7 For All Mankind is committed to maintaining the highest standards of quality and design, remaining the brand everyone trusts, loves and respects. WHERE IS 7 FOR ALL MANKIND HEADQUARTERED? 7 For All Mankind international headquarters are located in Los Angeles, CA 90058, USA. WHERE CAN I FIND YOUR 7 FOR ALL MANKIND STORE LOCATIONS? 7 For All Mankind store and authorized retailer locations can be found here http://www.7forallmankind.co.uk/en_en/storelocator/.